Detroit Bold - O'Neil Family Michigan Roots - Detroit Bold Coffee Co. Happy 182nd Birthday, Michigan! Our home state celebrated its special day on Jan. 26th becoming the 26th state in the union in 1837. Detroit Bold’s family has been an integral part of Michigan’s statehood since the earliest days. Detroit Bold’s family has been an integral part of Michigan’s statehood since the earliest days. The O’Neil family immigrated here from Ireland in the mid-1800s, settling in Michigan’s Upper Peninsula at Keweenaw. They eked out a living as potato farmers and copper miners. 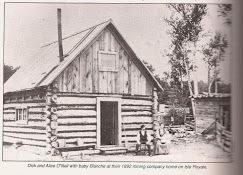 The picture shown is my great-great grandparents with baby Blanche in a copper mining community on Isle Royale in 1892. It was Native American’s who taught us the copper mining trade having discovered how to extract the world’s most abundant metal thousands of years earlier. It wasn’t until the promise for a better life that the automobile industry brought my family and millions like us from all over the world to migrate to Detroit. Michigan has an illustrious history in the journey of America and the people who call it home. After all, we all originally came from somewhere else, save those early copper miners to whom we owe a great debt of gratitude to for our very survival. Today, expatriates and Michigan lovers from every state in the country enjoy Detroit Bold by purchasing on our online store! What’s your Michigan connection and family story?